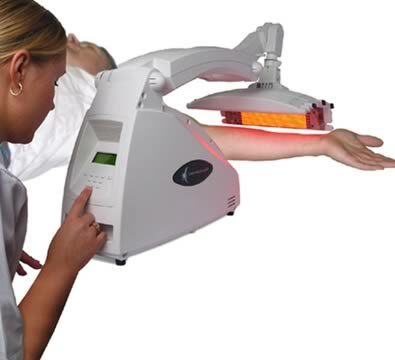 Photodynamic therapy (PDT) is a technique used for the treatment of various skin cancers. The technique has largely replaced liquid nitrogen therapy for extensive sun damage in most modern dermatology clinics. The treatment involves the application of a light sensitising cream to the treatment area and the subsequent exposure of that area to light. Which skin cancers can be treated by Photodynamic therapy? 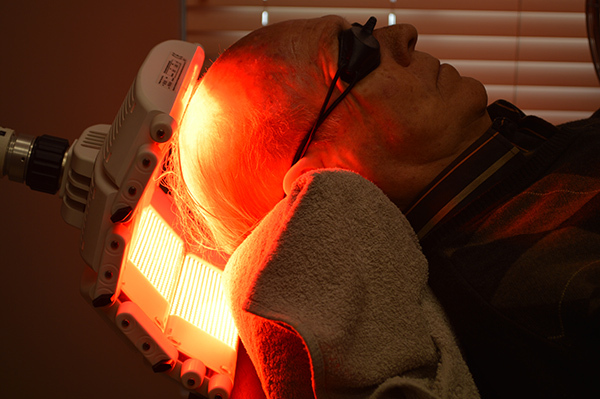 Photodynamic therapy (PDT) is used for the treatment of Solar Keratosis, Basal Cell Carcinomas, and Bowens disease. Is photodynamic therapy still an experimental treatment? No, photodynamic therapy has been used since 1988 and have been extensively investigated and subjected to many clinical trials. Look at the PUBMED medical database for the available published research on PDT. Rough spots in the treatment area are lightly scraped and a cream is then applied over the whole treatment area. The cream is left on for 1-3 hours. During this time you may leave the surgery, but most of our patients choose to stay in the clinic. After 1-3 hours the excess cream is wiped off and the area is exposed to a specific light source for 20 minutes. If the lesion is a basal cell carcinoma the procedure is repeated after 7 days. After the cream is applied the cancerous cells absorb the cream while the normal skin cells do not. The cream is converted inside the cancerous cell to a chemical that is extremely sensitive to red and blue light. After 1-3 hours the chemical is, for practical purposes, only present in cancerous cells and not present in normal skin cells. When the red or blue light is shone on the skin the chemical becomes activated and free radicals are formed inside the cancer cells. These free radicals then kill the cancer cells. It depends on how long the cream was left on the skin and what type of pain relief you have. If the cream is left on for about and hour, no pain relief is generally necessary. Most patients describe the pain at around a 4-6/10, with 10/10 being very painful and 0/10 no pain. If the cream is left on for about 2 hours an oral analgesic can be used for pain relief. If the cream is left on for more than 2 hours conscious sedation or other pain relief techniques can be used. The size of the area that needs to be treated also influences the degree of discomfort. If a small area is treated the treatment is done under local anaesthetic and therefore painless. Very common side effects are a burning sensation, stinging sensation, pain, swelling, crusting and redness. Less common side effects include itchiness, ulceration, suppuration, blisters, peeling, skin infection, hyperpigmentation and hypopigmentation. Urticaria is a rare side-effect. What are the advantages of PDT over other treatments? PDT destroys only cancerous cells and not normal cells. It is therefore selective and scarring is extremely unlikely. Liquid nitrogen therapy, surgery and curettage & cautery have a significant risk of scarring. Liquid nitrogen therapy very often leaves white spots following treatment. With PDT these side-effects are much less likely. PDT also results in significant skin texture improvement and has a general rejuvenating effect in the treatment area. How effective is Photodynamic therapy compared to other treatments? Clinical cure rates of Photodynamic therapy is similar to all the other treatment options, but has significant cosmetic advantages and does not affect normal cells. What are the medical aid codes in South Africa for the treatment? It depends on the size of the involved area, but generally between R1500 and R2100. Conscious sedation, if used, adds to the cost of the treatment. What happens when I arrive at the surgery for photodynamic therapy treatment? The area to be treated will be lightly scraped with a curette and wiped with acetone to remove any residue that could inhibit the absorption of the PDT cream. The light will be positioned over the area that needs treatment and you will then be exposed to a red or blue light source for 9 minutes. During the treatment you will experience a burning sensation. The longer the cream was left on, the more intense the pain will be. The burning sensation tends to build up over 3-5 minutes, then plato and after 5-7 minutes it starts to diminish. Another 1 or 2 treatments might be required at 4-6 week intervals, to achieve optimal results. What happens after the treatment has been completed? You will also experience a varying degree of pain in the treated area that can be relieved by taking Paracetamol (e.g. Panado, Compral) and NSAIDS (e.g. Voltaren, Brufen) 4-6 hourly. Regular use of Vaseline will help to keep the area smooth and prevent cracking. The intensity of these sensations is directly correlated to how badly sun damaged your skin is. Regular (3 hourly) application of a SPF 30+ sunscreen is essential for at least 6 weeks. I had a mole removed and the diagnosis came back ” left temporal area squamous cell carcinoma in situ, margins affected. Is your method good for treating this condition please? Hi Kris. Yes, PDT is a treatment option for squamous cell carcinoma in situ, aka Bowens Disease. I have just had PDT two days ago on the top of my head. I have previously had the Effudix cream treatment over 3 weeks which was absolutely terrible …especially when i accidentally washed my face with soap and got a serious infection that was incredibly painful and burning. Dr Louw is really very reassuring and stays with you while the light is on you. The cool fan blowing on my head during treatment was very good. When I reached 3 minutes i wondered if i could last for 8 minutes as it was pretty hot ! But by 8 minutes i even went for an extra 2 minutes to 10 minutes. I went straight home, took a sleeping pill and swallowed a Tramaset and went to sleep. When i woke up i felt a lot better. Yesterday morning i experienced extreme burning and itching, and put a 500g bag of frozen peas on my head for 5 minutes and had another Tramaset. The “ice” really helped. For the rest of the time i have had a fair amount of itching, but it is quite bearable, and have heaped on the vaseline …little bottle is almost finished!! I would encourage anyone needing this treatment to just do it. Now i know what it means to go and have your head red! Hi Gareth. Thanks for the feedback. Dear Dr Louw, I have had a few skin tumours removed from my face – and my practitioner has recommended undergoing PDT across my entire forehead as prevention as he says he can already see early signs of more – he says we can prevent more tumours with PDT. I am only 41 so prevention may be beneficial, but I am loathe to treat unnecessarily. Please advise me, I look forward to hearing your view. Dear Samantha. It depends on the diagnosis. If you had sun related skin cancers surgically removed and you now have multiple Solar Keratosis, then I would say PDT is an excellent treatment option. Just a quick query mate; I’ve been diagnosed with PXE (Pseudo Xanthro Elasticum) approx seven years ago. The skin spec I’m currently has recommended I try this treatment. It hasn’t been done in Australia yet and if it works, the treatment will assist so many people! What is/are your recommendations on my spec’s thoughts? Dear Kurt. PXE affects the dermis (the middle layer of the skin). The cream that is applied when doing photodynamic therapy generally penetrates only into the epidermis. I therefore do not think that PDT can have a major effect on the skin signs of PXE. PDT have been used by ophthalmologists to treat angioid streaks, which is an eye problem associated with PXE.